you just go to bookmyshow site and select sports - celebrity cricket league from menu. 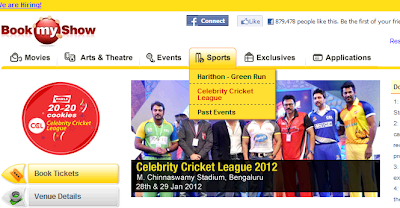 Select your seats and give your card details for payment that's all your ticket will be booked for CCL T20 Season 2. Do not carry transistors, computers, cameras or any other audio visual recording equipment as it is strictly prohibited. Tickets once booked cannot be exchanged, canceled or refunded. In case of Credit/Debit Card bookings the Card holder must present the said Credit/Debit Card at the ticket counter while collecting the ticket(s). Please share this article in social networks if it is useful.